Hello , and welcome to Status Quo; THE place for rankings, reviews and more! Status Quo is owned by us, Alia and Thomas, and was opened on March 2nd, 2014. Our site aims to provide you with quality reviews, to not only help benefit your site's service, but to also give you an opportunity at our prized ranking wall. We also offer a community section, where anyone can comment, favorite and submit their favorite sites! Get involved with your site community and send us a neomail today. We'll be waiting to hear from you soon! • We've been getting more listing requests and our site is growing! March 10, 2014 | sorry! • Thomas was a little lazy and forgot to put up updates! • got our first review completed! • We got some new sites listed today! • Status Quo is now affiliated with the BEAUTIFUL Buzz! • Our first day went very good! We didn't have quite the amount of people get listed as we had hoped, but the numbers are still pleasing :) Thanks everyone! First impressions matter when owning a well-rounded site, so we will be explaining what pops out, in both good ways and bad when we first visit your site. We will also provide suggestions to help you improve the overall visual welcoming effects of your site. Here we will discuss the quality of the content you currently have in your site. Depending on your site's category and age, we will discuss the good aspects of your overall site, as well as provide examples of what things we like on your site. We may also positively compare your work to those who've already made it to the high ranking positions, and focus on what you should keep doing well. This section will only include one tip, from both Alia and Thomas, and will revolve around what we think should be the most vital tip to YOUR site's path to success. Unfortunately, there is always room for improvement on any sort of site. (Or you wouldn't need a review from us right?) In this section, we will pinpoint any content errors that we see on your site. We will also give suggestions on how to improve your content, as well as providing examples of exemplar content at a level you should strive to reach. This section will just go over how often you update your site, and give you some suggestions to help you better improve/regulate time dedicated towards your site. Spelling and grammar are essential to any site! Here, we will be checking for any grammatical and spelling errors, and offering suggestions on ways to improve your spelling/grammar. We may comment on sentences or introduction stories that we like in particular. Once we've picked through all the little details, both Thomas and Alia will each leave quotes of their final thoughts on their overall view of site. 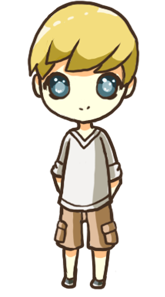 • Sam @ Ever Wonder | Status: Pick it up! • Mexxy @ Whitespace | Status: Pick it up! Welcome to the top site section of Status Quo. Here, we pick the top 4 sites in each category and put them here. We carefully look at each site, making sure that we are picking the right ones. Top site is updated once a month as sites are constantly changing and improving. To be eligible for a spot on the ranking wall, we take into consideration whether the site is up to date, as of right now, and the amount and quality of the content available. To exclude any bias, Thomas rates sites that Alia owns, and Alia rate sites that Thomas owns. 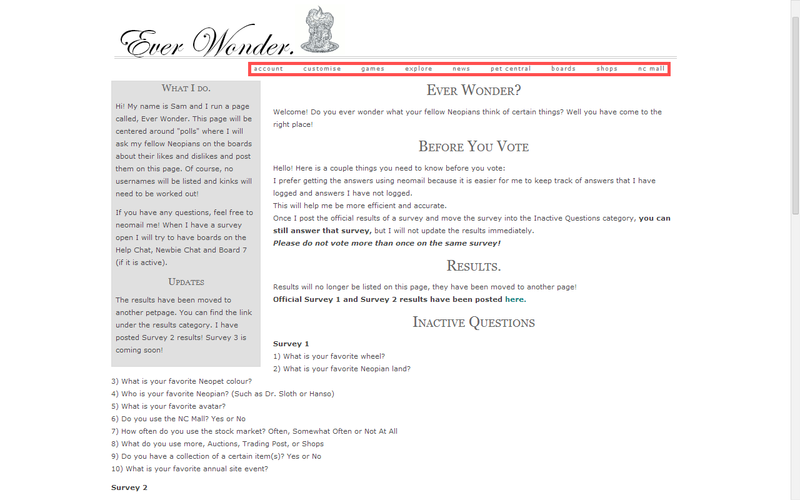 For example, Thomas does not choose the sites in the "button request" section as he owns a button request site, and Alia does not choose the sites in the "banner request" section for she owns a banner request site. Did you make the wall? Congrats! Why not grab a button or icon to let everyone know! Welcome to the Community section. This is the page in which you can leave a comment about someones site, or favorite it. The more favorites they get, the more chance they have of being on the Community Favorites section; so go out there and favorite the sites you love!!! If you are here as a site owner, and are not interested in favoriting or commenting, why not check out your own site? Read some of the comments people have left to improve your site! Is your site not listed? Do you want it to be? send me a neomail! Here is the Community section. This is the page in which you can leave a comment about someones site, or favorite it. The more favorites they get, the more chance they have of being on the Community Favorites section; so go out there and favorite the sites you love!!! SiteName is a cool site. This is where your bio about your site will go! That is, if you choose to be listed here! Which we hope you do for will help your site become better and more well known! Iris is a review site run by Abi and Joaquin. When you request a review, you essentially get two reviews in one! We strive for high-quality reviews that will help your site. Buttoneer is a quality button request and tutorial site. Here at Buttoneer, I aim to provide you with the perfect button for your site! But it's not just buttons you can get. No, you can also request a layout! The Gift is a button and layout request site by me, Joaquin. We offer functional, aesthetically pleasing layouts and crystal-clear, high-quality buttons. Craft is a button request site! Craft offers quality buttons that's delivered within a timely manner. Not only does Craft do buttons but we also have tutorials and we are always open to suggestion. + comments • Joyables (excalibur_joy): Ok, so i'm a big fan of Jenny's creations she's like one of my closest buddy in my neopets life and ever since she became a graphic artist i have seen her potential thus she focused on this, jenny's buttons started with low quality but had some great improvements in a short period of time! have my full support on you! best of luck on your button request site! keep it up! Learning to Fly is a premade CSS site that brings unique and different CSS to the community. If you're looking for something a little different to put on your petpage, stop by LtF! Coding requests are always open, so if you don't see anything you like, feel free to request a layout! Jewel offers custom made graphics such as buttons, icons and banners. We also offer petpage layouts and guild layouts all in high quality and speedy service. So why not request a custom graphic today?! Hayley's Stuff is a small little site where you can request buttons, pixels, icons and more, and pick up some premade stuff along the way. Bejeweledis a sub-site of Jewel, and is a resource and pre-made graphic site. It offers everything from bullets, to neoboard fonts and layouts. Check back often for new content! Echo Lake is a cool site. This is where your bio about your site will go! That is, if you choose to be listed here! Which we hope you do for will help your site become better and more well known! Site inc. is a link directory run by me Joaquin! I strive to make my directory as helpful as possible. Line Up is a community site that aims to provide daily, straight to the point information based off its watchlist of all the site community's request sites! Crumble is a new tea-party themed adoptable site, with lots of delicious treats such as cupcakes, cookies, lollipops and more. We also have a resource section and you are able to order up delicious custom goodies for yourself. Status Quo is a ranking and review site! Co-owned by Alia and Thomas, we try to provide you with the most helpful review in order to get your site in tip top shape. We also rank other sites, and allow the community to favorite/comment on others sites! Whisper is a competition site owned by Rose. The site offers unique competitions that include site of the month, button of the month, icon of the month, and customization of the month. Anyone and everyone can enter the contests and receive an icon for entering. Come check out Whisper today! We currently don't have a sibling site :( Be the first to apply? Why did we feature the site? We chose Everyday Quotes because of its aesthetically pleasing layout and graphics. When one visits the site, they can't help but feel calm, with a little smirk beginning to appear on their face. Aside from the cute and flowery layout, the banners that Alia creates are phenomenal! She is always able to choose the perfect image to coincide with the perfect quote. We both can't help but wonder where she comes up with it! Not only can you use one of her pre-mades, you can also request one! All the quotes on Everyday Quotes are sure to brighten your day and make everyone smile! We highly recommend paying it a visit. You won't regret it! Alia: Blah Blah Blah Blah Blah blah. Blah Blah Blah Blah Blah blah. Blah Blah Blah Blah Blah blah. Blah Blah Blah Blah Blah blah. Blah Blah Blah Blah Blah blah. Blah Blah Blah Blah Blah blah. Blah Blah Blah Blah Blah blah. Thomas: Alia is an extremely kind and sweet person! All of her sweetness obviously translates to the banners she makes! All of them are so prim and perfect and cute! I love just going to Everyday Quotes and re-looking at all the banners. View the Featured Site archive? Everyday Quotes is a site that provides quality banners with some of your favorite witty quotes. Everyone needs a pick-me-up quote once in a while, and this site will provide the banners to put your frown upside down. Welcome to the news section. This is where site owners (or anyone for that matter) can post news about their site. Are you re-opening? Re-vamping? Re-locating? Or do have plans of fusing every site in the community together!? Well, we don't really recommend doing the last one, but please submit any news you have at all! Posting it here will help get the word spread. So, you look eager to post news. If you are ready to, just send a neomail telling us what site has news and what the news is. We will do the rest. Status Quo was a started on a whim, when Thomas and Alia noticed that there weren't many sites who were focusing on the community. Alia thought that people should have the opportunity to rank and rate their favorite sites, while also having the chance to getting their sites on a ranking wall. Both Thomas and Alia have owned multiple sites before, so they wanted to work together to create a site that would give the opportunity for every site to shine. Status Quo is not like other ranking sites, where top sites are chosen randomly all the time, but Status Quo gives the chance for anyone to be able to get a review, and once reviewed, have a chance at making the prized ranking wall! With all that in mind, Status Quo was born on February 25th (Alia's birthday), and started on March 2nd, 2014! Hi there, I'm Thomas! So I guess you want to know a little about me, huh? Well first thing you should know is that I'm obsessed with whales! I really don't know why, I've just always been! so if you ever want to strike up a conversation about whales, I'm ready! Anyways, aside from whales, I lovemusic! Music is basically my life! Some of my favorite singers include Lana Del Rey, Goldfish, and anything Disney! When I'm not listening to music (or while I am) I can usually be found sitting outside drawing. Art is one of my greatest passions! I do it every chance I get. It just makes me feel so good. Alright, well, I guess thats the basics, but if you want to know more about me, check out my user lookup! Feel free to send me a neomail too! I love talking to people, so don't be afraid! Upon first looks, your site is breathtaking! I've seen a lot of CSS sites, but you have a good balance of fancy CSS and regular, plain-jane CSS. Most coders either use way to much fancy stuff to the point where it looks like they are showing off, or they don't use hardly any and make it look like they aren't a very skilled coder. You, however, have the perfect mix! Moving on, your color schemes is lovely! The purple, yellow-green, and red all go together wondefully! Your header is also stunning! I love how simple it is, yet it makes such a big impact. The little rockets are also a big plus! After staring at your main page in awe, I knew it was time to move on. The next thing I noticed was your navigation. It is very simplistic and elegant; so are your rules! You pulled both elements off beautifully. On the other side of the screen however, I almost didn't even notice the feedback. This is because I work on a large monitor, so you obviously right-justified it, causing it to be way out of sight on my screen. Now I know you probably did it like that so that it would stay somewhat "Centered" since your whole layout is, but you obviously created your site to be viewed on a smaller screen or laptop. This however is a minor problem and does not necessarily need to be fixed. Continuing on, I love the hover effect you have for each layout! It's very convenient that you put tips and tricks right on top of it. The only downside is that there are quite a few mistakes in the tips and tricks sections. Now, I won't go to in depth, as we go in depth farther into this review, but there are quite a few grammatical errors, and unprofessionalism is also abundant. The amount of smilies you use is not bad, however, there are still quite a few. Smilies make you seem unprofessional. Now don't get me wrong, when you are just communicating with someone, feel free to use them (I personally go a little overboard when it comes to smiley usage), but on your site, try to avoid using them. Instead, use various punctuation styles/techniques to show your emotion. The last thing I will touch on in the start section is your sitely section. To me, it is very sleek and wonderful! I love how it has the purple background to make it stand out amongst the rest of the page. I also quite enjoy how you went about doing the listers. I like how they are not just simple text links; they are a little more "showy," which is a good thing since you decided not to use buttons. Plus, it's another example of what you are able to do with CSS. With that in mind, I was a little disappointed with how scrawny and squished your text font seemed to be. Just to clarify, my screens resolution is 1280 x 800, and the browser I'm currently using is Chrome. The most important section to your site, which are the rules, were extremely hard for me to read, and almost made me want to just steer away from the rules. The navigation also had the same problem as well, which was a real blow to your site. I don't know whether you use a different browser or screen resolution, but since most people use Chrome nowadays, you might want to think about getting that checked out. Also, though the hover tips are a very unique idea, with the purple background you chose, it's hard to read the text on it because it is a little too bright on the eyes at first glance. Another thing that I loved about your layout was the color scheme. Purple and gold go lovely together, and I love the gorgeous logo that you made for your site. The name "Whitespace" is a simplistic and witty name as well, because it captures your site's purpose so clearly, using only one word. Your content was gorgeous, and I especially enjoyed the lookbook idea. It's something that I've never seen done before, especially when you provide premade buttons to go with the page; what an ingenious idea! Your sitely section was neat and orderly, and gave a nice contrast to the plain white background throughout the rest of the site. The only thing that struck me about your content that I didn't like was the amount of it. Your layout style seems to be very chic, simple, and easy to browse. The site header is gorgeous, and we love how you incorporated rockets in your design to make a "pun" on your site's name. Your site's essence was modern, yet unique enough that it's set apart from other layouts. We liked the innovative design you have for your "my lookbook". Not only does it combine a 'facebook-esque' kind of style, but it also has those extra nifty buttons for your viewers to use. The hover over the preview was great as well because it gives viewers simple tips that can help elevate your layouts. Also it's something that we've never seen done before. The quirky little messages describing each layout design give your a site a more comfortable and enjoyable viewer feel. The various "themes" to choose from for each layout and very ingenuitive css coding helped set apart your site from other css sites! Alia: Stay away from smilies, ellipsis', and run-on sentences. Although I myself am an avid user of smilies, I tend to steer away from them being added into my content. Trust me when I say that I have a slight obsession with overusing smilies in my conversations online and through text messages; but there is a time and a place to use smilies, and inserting them into your site's content is not one of them. Although we go over this in your grammar section, I find it very important for all sitemakers to not only have a clean layout and great content, but to also have correct grammar. Sometimes it may be a stylistic choice to add in a smiley or two to your updates section, but adding them anywhere else on the site detracts from professionalism points. If you don't believe me, go through some of your favorite and most respected sites, and you will see no traces of smilies in their content whatsoever. Keep in mind that run-on sentences was something you struggled not to do, and makes the site not as enjoyable when being read through. Your biggest weakness, in my opinion, is not skill or content quality, but instead it's grammar. Thomas: Watch out for the unorganization monster! A common problem CSS coders face is having disorganized pages. Their layouts are always exceedingly beautiful, but they tend to lack organization. This is because many are beginning to stray from using anchored pages, and in turn have all the content on one single column with navigation, but don't always clearly define where one section starts and stops. In your page, you have the same problem. Yes, you do have headings for each section, but they are light gray and very small. In fact, the first time I looked at your site, I didn't use the navigation, and had no clue you were even separating layouts. I thought to myself: well this is odd, why did she not separate anything? How do I know which type of layout is which? The second time, I used the navigation, but again, because the headers were almost non-existent, I practically missed it. I finally noticed it when carefully looking at your site. So either make your headers bigger and darker, or maybe do what you did in the sitely section and add a colored background for each section. The text is very hard to read because it is squished so close together. We don't know if you did this on purpose, or it just shows up funny in my browser/resolution, but we have a hard time reading the rules, which should be one of the most important parts of a css site. Also, although you have some pretty nifty layouts, there isn't much to choose from. We know one of the reasons why we didn't choose your site to put your site in the Ranking Wall is because you do not have enough content as we would like to see. Although your site is young, we feel that it should have at least a couple more layout styles to choose from. Also, instead of resources, you may want to label the tab: Backgrounds. Because as of right now, all you have are backgrounds, and it's hard to tell what they look like, or what they even are, with those tiny previews you've given. Think about separate each layout style a little more, because it runs together a little; it can be hard at a first glance to differentiate between the coding for each style. It's not a huge problem, but a little space wouldn't hurt. Also, in the sitely section, the brownish-green text is a little hard on the eyes. To make your site look more aesthetically pleasing, make your link back buttons centered instead of left justified. It looks rather awkward with them not being centered, and makes it seem empty, even though you have quite a few buttons. The box you use to give updates is quite a nifty one! We like how you titled it "News Flash", and made sure to pick a background the doesn't contrast, but still focuses attention on the different text colors in order to make your updates stand out. You have quite a few updates in that one little box though; either make the box larger, or delete some of the older updates. We suggest just deleting some of the older ones as the small box looks good with your layout. Explanation: An apostrophe is needed because you left out the "un" in "until. Explanation: You need to specify what can not be claimed as your own. Now, if I am thinking like you correctly, you probably wanted to keep the rules at a pretty even length, so you can leave it if you want, but it is grammatically correct to do it the way we have shown you. You also need a semicolon instead of a comma since you have two independent clauses that are closely related. If you want to keep the comma, then I suggest adding a subordinating conjunction such as "and," but the semicolon works better. if coding is not listed here, is not for your use. if coding is not listed here, it is not for your use. Explanation: I'm assuming you meant to put "it's." But if you didn't, well, just saying "is not for your use" is incorrect. You have to answer the question of what is not for your use; What's not for your use? The coding not listed here is. Don't like the default? Well then... visit the resources sections for some free domain patterned backgrounds you can use! Don't like the default? Well then, visit the resources section for some free domain patterned backgrounds you can use! Explanation: (Before I tell you way, please not that this is on all the hovers) An ellipsis is not proper grammar in this case. You use an ellipsis to show a large break or when just using a section of a direct quote. As you are not doing either, a comma would be more appropriate. Also, an "s" is not needed after the word "sections." This is because there are not multiple resource sections. There is only one. You use a lot of smiles. These make your site seem unprofessional. I suggest going through your whole site and removing them. I know it's useful to show how the text is being "said," but its highly unprofessional, as i said. simple is whats in, do you follow the trends? Simple is what's in; do you follow the trends? Explanation: Without a semicolon, your sentence is a run-on sentence. Also, you need to add a comma to "what's", because you are trying to say "what is". let them eat cake as marie antoinette said ;) ~ very simple and compact layout to showcase the little things. Let them eat cake" as Marie Antoinette said. This layout design was made very simple and compact in order to showcase the little things. Explanation: You should put quotation marks around your quote since you want to emphasize the fact that Marie Antoinette said it. Also, smilies in any place other than the updates make the site seem a little bit unprofessional, so try not to include them in your content. The last sentence was a run-on sentence, and although it may have been a stylistic choice, it is also a bit unprofessional and is incorrect grammar. Mmm… gross desserts and candies; all the themes included are zombie inspired. Explanation: You seem to be into run-on sentences, but I do admit that I sometimes like to insert run-on sentences into my site's descriptions as well. I added an ellipsis after "Mmm", in order to give it a prolonged effect, as if you were actually having a sigh after glimpsing your delicious layout! Also, desserts was misspelled, and the semicolon was added to get rid of the run-on sentence. Alia: Whitespace is an amazing site that's already showing so many signs of professionalism. Although you're not quite at the point of being a top-dawg, I still consider your site's to be one of the best CSS sites on here. I had an extremely hard time with finding a lot of mistakes on your site, and I think you have a large potential to make your site grow into one's as big as Bedazzled or Nienke's Premades. Your site was a joy to scroll through, and the only reason it's being graded down, is because of a few big blemishes that you need to fix before it can continue to grow. Remember that although we've given you many different points of criticism to look at, it's only going through nit-picky details that we have to point out. I can't wait to see what you have in store for Whitespace in the future Mexxy, and I'm really looking forward to revisiting your site again sometime in the future. Thomas: Overall, your site, Whitespace, shows signs of becoming a great site. You already have the layout part down, so now all you have to do is get the content part down. But seeing what you already have, the future looks promising. So just keep making layouts and always keep your chin up. Reviews can seem harsh, but they are necessary for your site to become great. 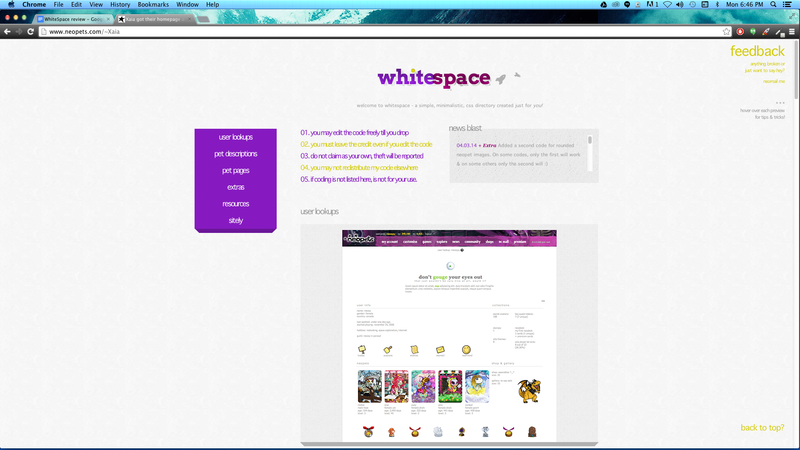 Whitespace is an amazingly versatile site with modern professionalism incorporated into it. We both thoroughly enjoyed scrolling through your site, and look forward to seeing it grow with you. Although we loved your content and minimalistic taste, you had a lot of grammar and coding issues, that made big dents in your overall impression. Because of this, we chose to give your site and Advanced grade. Advanced mean's that your site is definitely on the verge to becoming expertly polished, but still needs some work before it get's there. But once you put in that work, you have a very good chance at making the ranking wall. Thank you for choosing Status Quo for you review, and we hope to hear from you again. Now that you have been reviewed, why not take this button that when hovered, says the score you received to display on your site? Upon first looks, the site doesn't seem half bad. My eyes are immediately drawn towards the title, for it is the darkest, boldest, and largest text on the page. Although, speaking of the title, there is one confusing aspect--the glittery candle. Don't get me wrong, I love how it looks, it just seems rather out of place; a candle doesn't, in my opinion, relate to anything your site offers. Maybe on a really deep level you could make a connection, but to the general public, I don't think it has much of a purpose. Maybe instead of a candle, find a cool question mark or something like that. Next, after looking at it for a few more seconds, your site feels bland. The only color on the whole page is the linked text and the button at the bottom of the page. Some sites do use a black and white scheme, but it must be done tastefully. To get it to work, maybe have a large black and white image, but leave anything blue in the image colored. That way the blue links will make sense and stand out whilst still having a purpose. This all kind of relates to you maybe thinking about getting a new layout, which I talk about later in the "a tip to consider" section. A new layout will give your site a fresh, edgy look, instead of looking like you grabbed a template and haven't modified it much (which appears to be what's been done). People like visiting sites with very robust layouts; things that haven't been done before. However, black and white themes are very hard to pull off, so I suggest just getting a new color palette. Color is one of the most important pieces to aesthetics in Maslow's hierarchy of needs. The next thing I notice is the lack of new questions. When I first took a look at the site, even on my big screen, I didn't realized you even had new questions. Thats why i thought to myself: well, this is odd. Why would there not be new questions? It wasn't until I scrolled that I noticed them. 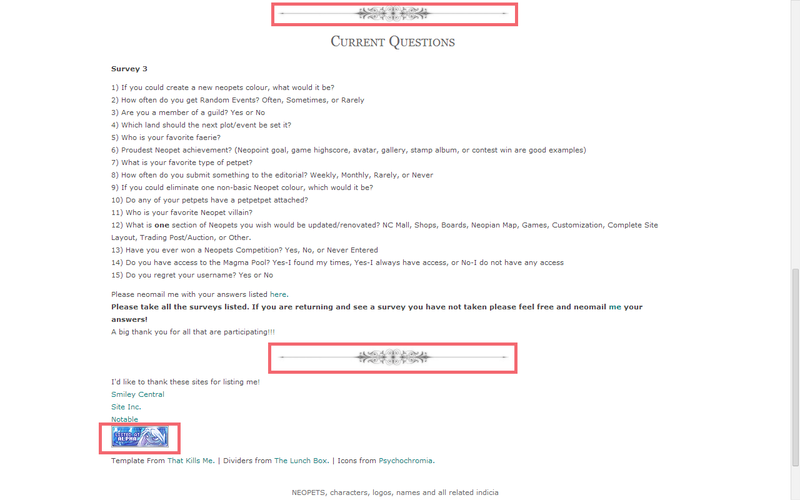 Since your site is almost solely based around asking questions, move the "current questions" section to the top of the page. Now that I have been looking at Ever Wonder for a little longer, I also notice the lack of updates. As there is a whole section for us to talk about updates, I will be brief. Think about adding the time, or at least the date of when you post the update so people know when you last updated. Otherwise, people won't like your site as much, because they won't know if it is updated often or not. First things first, the simplicity of your layout and your site's name already intrigue me because of how different they are. Some simple changes that I would suggest are adding a little color to your layout by requesting a nice banner, or even changing your header and divider colors. Although your layout is simple, it's not properly aligned on my screen. Just to clarify, my screens resolution is 1280 x 800, and the browser I'm using is Chrome. Also, though the shimmering candle adds a bit of flair to your site, it's not a very attractive glitter; not only is there no color, but it is what I would call an "over-glittered" glitter. Also, your candle seems to be floating in mid-air? You can change that by simply editing the graphic, so that it has no space underneath it. When it comes to content, everything in your site should be neat, orderly, and consistent. The divider's that you are using are only used for two sections, which is inconsistent. You should either use dividers for every title, or use none at all. Also, there is no need to include a directory's button, whilst listing all the other directories in text. Either choose to use text, or choose to use buttons. May I recommend you use text, because not only does it keep your sites content condensed, but it also keeps it looking more professional. Another thing you should consider doing is adding links for easier access to places that a viewer might be looking for. Whenever you include the words: "neomail me", you should link the words to a preloaded neomail url that can be send to you. We love that you chose a great name to match your site's theme. It helps spark the curiosity of the viewer before they view the site. You also had a very creative idea going when you created this site, because we don't think it has ever been done before. Putting the "what I do" and "updates" in a separate box helped keep the site looking clean and practical. If someone wants to solely see what you are about, it is conveniently blocked off, and does not interfere with the main content of your page. The simple design makes your page very clean and easy to read. Alia: A key part to owning a great site is getting feedback on how others think you're doing. I would suggest that you consider getting a counter. You can find great counters on boingdragon. Having a counter to see how many views you get gives you the information to see if you're getting the necessary amount of views for the site. If you're not satisfied once you put up the counter, you should consider different options on ways of how to advertise your site idea and get it more out there. One important option to consider is getting listed at more directories! Although you already are listed a four known directories, you should try to get listed at even more. Because your site is an idea unique idea that no one else seems that have done before, adding your site to more directories will help advertise to those who are in need of something new and different. Thomas: If I could say one thing to help you become more successful as a site owner, it would be this: don't settle for what has always been done; do your own thing and don't be afraid to break boundaries. When I looked at your site, I felt like I was being taken back in time--back to a time when site owners sites were bland, and the only navigation they had was the general neopets navigation. Now, I do understand that your site doesn't really have the need for "special" navigation, but maybe you could break it up into three sections. 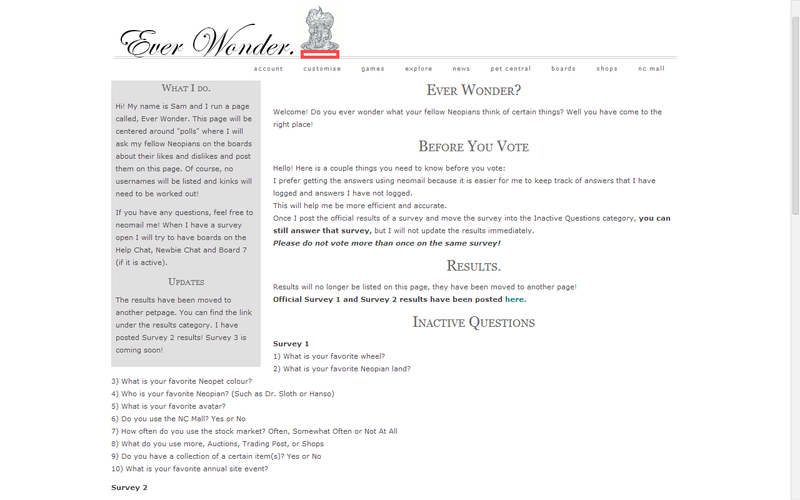 For example, you could have a "home" page, a "current question" page, a "past questions" page, and a sitely page. This would keep your site as a whole more organized. The human race is a simple species; we are easily amused by little things. I, personally, like it when sites have pages. I don't really like having to scroll through stuff. Little, almost not noticable, things like that are what people are really noticing subconsciously. So, think about breaking your content up into sections. And if you aren't a skilled coder, I highly recommend requesting a layout. A key part to having a great site, is captivating readers with not only content, but a great layout as well! Since you have a great amount of content on two separate pages, it would make it both easier for you and the viewer if you were to just get an anchored layout. Speaking of the content, the current main content seems to almost be. . .awkward. Instead of being perfectly aligned, the gray box kind of throws everything askew. This can be easily fixed by putting your main content in a separate .div box, so that it continues straight down the page rather than wrapping around the gray box on the left. While still on the subject of disorganization, the "current questions" is in a rather awkward place. As they are the current ones, they should be placed at the top so people know about them. At a first glance, we didn't even realize you had new questions. We thought you hadn't added any new ones yet. If you want people to know about your page, then you should have a button to help advertise it. All successful sites have them. When it comes to updating your sites, you should always have a date so your viewers can be better informed to how active your site may be. Consider also putting your date in this form: March 8th, 2014, because some viewers record the dates like this: 3/8/14, while others record it like this: 8/3/14. Also, don't only show the most recent update. Let others see at least the two or three preceding updates so that people know how regularly you update. Another thing to consider is using bullet points. You can choose to use a whole "paragraph," but keep the words flowing better. After reading the one update you have, it seems to be very choppy, so we'd recommend you use bullets to separate ideas. In this section, please not that for each item we correct, we will write what you wrote first, then the change in italics next, and finally an explanation of why we did what we did. Hi! My name is Sam and I run a page called, Ever Wonder. 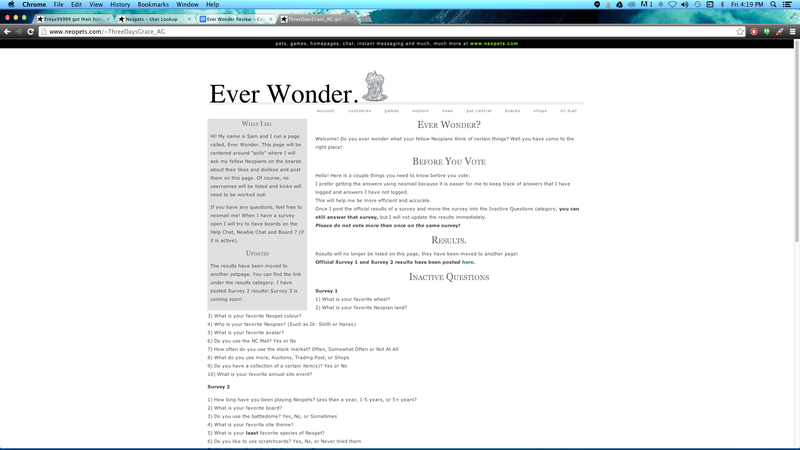 Hi, my name is Sam; owner and creator of Ever Wonder. Explanation: Having a sentence just say "Hi!" is technically not a sentence. Yes, there a subject (undefined you) and a verb (the word "hi" is commonly seen as a verb in this scenario), but it is not proper sentence structure. That is why we combined it with a comma; it sounds more professional. Next, I removed "I run" for you just mentioned your name, so the audience is assuming it is still you talking. Saying "I" was a tad redundant. Thirdly, a took out the comma in front of Ever Wonder as it was not necessary. It was neither an afterthought nor an interrupter. This page will be centered around "polls" where I will ask my fellow Neopians on the boards about their likes and dislikes and post them on this page. This page will be centered around polls in which I will ask our fellow Neopians about their likes and dislikes and post the results here. Explanation: To start with, polls does not need to be in quotations. If you want emphasis on it, then we'd suggest making it bolded, or not doing anything about it. However, putting the quotations breaks rule G of grammar. Next, we changed "where" to "in which" for it is a more precise/exact explanation to transition to what you are doing. Where is a relative term, and as it works, "in which" is the better option. Thirdly, I changed "my fellow Neopians…" to "our fellow Neopians." If you think about it, more than likely another neo player will be the one visiting your site. Saying "my" makes it sound like they are just your fellow neopians. What you did is not technically wrong, but it does leave room for bias. Lastly, I removed "...post them on this page," and replaced it with, "post the results here." By saying what you originally had, you sound repetitive, because just moments ago you said "this page," so obviously they will be posted there. When I have a survey open I will try to have boards on the Help Chat, Newbie Chat and Board 7 (if it is active). When I have a survey open, I will try to have board on the Help Chat, Newbie Chat, and Board 7 (if it is active). Explanation: A comma needs to be put after the word open. This is because the phrase at the beginning is a dependent clause and needs the comma to conjoin it with the independent clause.The other thing we did was we put a comma after "Newbie Chat." The comma is not necessary (as new comma rules state that you no longer need it), but having the comma makes it sound better. Without it, it sounds like there is a board called "Newbie Chat and Board 7. Well, looks like you have come to the right place! Explanation: a comma is needed after well, as it is a transitions at the beginning of a sentence. Secondly, I added "looks like you have," because it flows better. You could leave it out, but to help with sentence fluency, I recommend changing it. Explanation: Since you are describing more than one "thing", you should be using are instead of it. Also, there is no need to say "Hello! ", because you have already greeted the viewer with "Welcome! ", in the introductory line above. I prefer getting the answers using neomail because it is easier for me to keep track of answers that I have logged and answers I have not logged. I prefer to get the answers via neomail because it makes it easier for me to keep track of answers that I have already logged, and answers that I have not logged. Explanation: Choose a tense, and stick with it. In most cases, you seem to be going with the present tense, so you should say "get" instead of "getting". Also, the neomail process helps make it easier for you to keep track of answers, so you should include that in your phrase as well. Alia: Although we seem to be pointing out many errors in your site, keep in mind that our reviewing patterns tend to be very nitpicky. Don't feel down or deflated by our feedback, but instead use it to help get you get your site rolling in the right direction. You have a great idea, which may I add seems to have already gotten you featured on the Site Spotlight, so keep those creative juices flowing. Right now, all you have are a few grammatical errors, and plain layout; these things can be easily corrected by simply requesting a new layout, or revamping the site to your own preferences. Thomas: You might feel like all we pointed out was one negative after the other. But please don't let that discourage you! Many site makers don't even have the guts to get a review, in fear they won't be good enough. You, however, asked for a review, and thats what we are giving to you. The reason there seem to be so many negatives is because we have to be nitpicky. Fixing what we have pointed out to you will help improve your site, and allow you to blossom into a successful site owner. You have a very unique and creative concept, and I see your site going far, you just need to make necessary changes for it to do so. You received a rating of intermediate for your site because it is definitely a step up from being a beginners site. The reason the rating is seemingly low is due to the fact that your site is still in the "needs improvement" category. You have a great idea that we are sure will blossom, but you first need to get through fixing all the mistakes. Your site has a bright future, and we look forward to seeing it grow. Thanks for choosing Status Quo!